May 29, 2012 - by benign0 - 15 Comments. In the entire course of this impeachment trial, I have faced many difficult challenges to my own and the Court’s collective wisdom, our sense of justice and fairness, the delicate balancing act we must perform to ensure that we do not stray from the strictures of the Constitution, the law and our rules. This trial began and unfolded against the backdrop of a highly charged and emotional atmosphere, acrimonious debate in and outside the confines of this Court, and a deep political fissure which threatened the stability of our democratic institutions. But the impact of the many events that transpired since December 12 last year to this very day, taken altogether, cannot compare to the sense of heaviness that I feel at this very moment. The culmination of this national drama is at hand, and the time has come for me to render judgment on the person before whom I took my Oath of Office as a Senator of the Republic…no less than the Chief Justice of the Supreme Court, Renato C. Corona. The Respondent Chief Justice and his family understandably feel deeply hurt, pained and aggrieved. As a lawyer, I must confess that I was personally frustrated by the loose and hasty crafting and preparation that characterized the presentation of the charges contained in the Articles of Impeachment. It seemed that the case was being built up only after the charges were actually filed. The repeated recourse to this Court’s compulsory processes to obtain evidence which normally should have formed the factual basis of the charges in the first place further burdened and, at times, taxed the patience of this Court. We have witnessed with disdain the indiscriminate, deliberate and illegal machinations of some parties who have been less than forthright with this Court in presenting dubiously procured and misleading documents which were spread to the media obviously to influence this Court’s and the public’s opinion. The letter of the Administrator of the Land Registration Authority which contained, as an attachment, a list of 45 properties supposedly owned by the Respondent Chief Justice, was fed to the media even before we could begin the actual trial of this case. Even before the Hon. Ombudsman, Conchita Carpio Morales, was called to testify before this Court, her letter to the Chief Justice requiring him to explain in 72 hours an alleged aggregate amount of US$10M in several dollar accounts was leaked to the media right before the resumption of this trial last May 7. We have sternly cautioned against unethical and unprofessional conduct, the penchant to engage in trial by publicity, to use the media to disseminate and advance so called “information” or “evidence”, to provoke and disrespect this Court and its members, and to irresponsibly hurl disparaging insinuations and accusations. We have tried to impress upon everyone who may be similarly motivated and inclined to test our will that this Court means serious business and would not succumb to nor allow such underhanded tactics and gimmickry to deter us from our task. Prudence and justice dictate that in determining the guilt or innocence of the Chief Justice, we must try our best to confine ourselves to the pieces of testimonial and documentary evidence that have been presented to this Court, to pass upon their relevance, and to measure and weigh their value in the light of the charges before us. After all the accusations levelled against the Chief Justice – eight (8) charges in all comprising the Articles of Impeachment – the Prosecution chose to present evidence only on three Articles (Articles II, III and VII), and abruptly rested its case. I have always believed that of these three, the case for the Prosecution and the Defense will rise or fall on Article II, which is the subject of this vote. This Court, at one point, had extensive discussions and differences of opinion, to be sure, regarding the charge contained in Paragraph 2.4 of Article II that the Chief Justice was “suspected and accused of having accumulated ill-gotten wealth, acquiring assets of high values and keeping bank accounts with huge deposits”. We ruled to disallow the introduction of evidence in support of Par. 2.4 which, to this day, I strongly maintain was an invalid charge, it being based on mere “suspicion”, on so-called “reports”, rather than on factual allegations. The Defense and the Chief Justice himself somehow revived this issue of the nature of his assets by introducing evidence to prove that his income and assets were legitimate, and by testimony to show how he and his wife had saved and invested these savings in foreign currency over so many decades. I wish to reiterate, for the record, that the Chief Justice does not stand accused of having amassed any ill-gotten wealth before this Impeachment Court. Paragraph 2.2 of Article II of the Articles of Impeachment accuses the Respondent Chief Justice of failing to disclose to the public his statement of assets, liabilities and net worth as required by the Constitution. I submit that the Chief Justice had justifiable and legal grounds to rely on the Supreme Court’s procedural and policy guidelines governing such disclosures as embodied in a Resolution promulgated way back in 1989 when the Respondent was not yet a Member of the Supreme Court. Under the said guidelines, the Clerk of Court of the Supreme Court, who is the repository of the SALN’s submitted by all the Members of the Supreme Court, may furnish copies of the SALN’s in his or her custody to any person upon request, and upon showing that there is a legitimate reason for the same. The Constitution, in Article XI, Sec. 17, states that “in the case of the President, the Vice-President, the Members of the Supreme Court, the Constitutional Commissions and other constitutional offices, and offices of the armed forces with general or flag rank, the declaration shall be disclosed to the public in the manner provided by law”. R.A. 6713, known as the Code of Conduct and Ethical Standards for Public Officials and Employees, recognizes the public’s right to information on the assets, liabilities, net worth, financial and business interests of public servants. But it likewise declares it unlawful for any person “to obtain or use the same for purposes contrary to morals or public policy or for any commercial purpose other than by news and communications media for dissemination to the general public”. Whether the said guidelines violate the letter and spirit of R.A. 6713 and the principle of public accountability is not for this Court to pass upon. I grant that the Chief Justice believed in good faith that after periodically filing his sworn Statement of Assets, Liabilities and Net Worth, the guidelines issued by the Supreme Court were sufficient to allow the Clerk of Court to comply with the Constitution and the law. We cannot ignore the fact that the failure or refusal, particularly of public officials in high government positions, to provide the public or the media with copies of the SALN’s, continues to be a raging issue to this day. In fact, some, if not most of the members of the Prosecution panel itself, the Members of the Supreme Court, members of Congress and other high officials of the government have been challenged by media organizations to make their SALN’s available to the public and to the media. Paragraph 2.3 of Article II further accuses the Respondent Chief Justice, based on “reports”, of not including some properties in his declaration of his assets, liabilities, and net worth, in violation of the anti-graft and corrupt practices act. The Prosecution, based on the list it procured from the LRA, claims that the Chief Justice owned and failed to fully disclose in his SALN 45 real estate assets. Based on the evidence, I am convinced that the Defense has presented credible evidence to refute this charge and to explain the exclusion in the Respondent Chief Justice’s SALN’s of certain properties which have either been sold or legally transferred, properties which are actually owned by his children and/or third parties, and properties which were never owned by the Respondent in the first place. I am likewise convinced that the Defense has sufficiently established that there was no ill intention on the part of the Respondent to understate or misrepresent the value of his real properties. Proceeding now to the most significant charge involving the non-disclosure of the Respondent Chief Justice’s cash assets, the Ombudsman, at the instance of the Defense, testified with a presentation of a report from the Anti-Money Laundering Council (AMLC), showing 82 bank accounts allegedly belonging to the Respondent. She further testified that based on her analysis of the report, aided by the Commission on Audit, the Chief Justice had cash assets in the examined bank accounts of anywhere from US$10 Million to US$ 12 Million. Even if we grant the existence of these 82 accounts, the amount of deposits corresponding to each of these could not just easily, fairly or logically be summed up to arrive at exactly how much cash assets or deposits, in actuality and in totality, the Respondent Chief Justice had or has at any given point in time. Hence, the Ombudsman’s reference to a “transactional balance” of about US$12 Million should not mislead this Court in its appreciation of the facts. Regrettably, both the Prosecution and the Defense panels decided not to present the concerned bank officers or the AMLC to ascertain the veracity of the data allegedly provided by the AMLC to the Office of the Ombudsman, despite the Respondent’s submission to this Court of a written waiver to cause the opening of all his bank accounts. Laudable as this belated act on the part of the Respondent Chief Justice may be, it would have served him better if he had just presented bank documents as evidence to either confirm or refute the documents showing his bank transactions as presented by the Ombudsman. It has not escaped this Presiding Officer that initially, last May 22nd to be exact, before he walked out of the halls of this Court, the Chief Justice signed the said waiver in open court but made the release of the same conditional, that is, after all the 188 signatories to the Articles of Impeachment and Senator-Judge Franklin Drilon have signed a similar waiver. It was only during the hearing last May 25 that the Chief Justice decided to submit the waiver to the Court without any conditions. Moreover, even as the Chief Justice had full access to his own bank accounts and all the opportunity to introduce evidence to disprove the data, findings and analysis presented by the Ombudsman or the report of the AMLC, the Defense did not introduce any such evidence. As it is, the Impeachment Court could only rely on the documents supplied by the Ombudsman which show the Respondent’s bank transactions but which do not show the actual bank balances of Respondent’s bank accounts. Instead, the Defense presented the Chief Justice himself as its last witness and pleaded for the Court’s permission to allow the Respondent to deliver an “opening statement”. This Court, out of courtesy to the Chief Justice, decided to extend its understanding and to exercise liberality in granting the request. The long narration, where the Chief Justice touched on a wide range of issues, assertions of facts, accusations, opinions and personal sentiments, which the Respondent said he found necessary to narrate in order to clear his and his family’s name, was later adopted by the Defense as the direct testimony of the Respondent. The Prosecution, on the other hand, waived its right to cross-examine the Chief Justice, provided the Defense would not conduct any further direct examination. Nevertheless, the Respondent Chief Justice testified and admitted, in answer to questions from a member of this Court, that he had around P80 Million in 3 Peso accounts and US$2.4 Million in 4 US Dollar accounts, but that he had purposely not declared these assets for 2 reasons: (1) That his Peso accounts represented “co-mingled funds”, and (2) That he was not required to report or declare his foreign currency deposits in his SALN because they were absolutely confidential under R.A. 6426. If, indeed, any of the Respondent’s cash deposits were co-mingled with the funds belonging to other parties such as the Basa Guidote Enterprises, Inc. (BGEI) or his children, the Respondent was still duty bound to declare these deposits in his SALN, they being admittedly under his name. The evidence is devoid of any indication that the Chief Justice was holding these funds in trust for or that they were actually beneficially owned by any one other than himself or his wife. Assuming that any part of such deposits in truth belonged to third parties, the Respondent could have indicated such third-party funds as corresponding liabilities in his SALN. That would have reflected his real net worth. With all due respect, I believe that the Respondent Chief Justice’s reliance on the absolute confidentiality accorded to foreign currency deposits under Section 8 of Republic Act No. 6426 is grossly misplaced. Are we now to say that this Constitutional command is limited to a public official’s assets or deposits in local currency? If so, would we not be saying, in effect, that the Constitution allows something less than a full, honest and complete disclosure? It bears noting that the prescribed form of the SALN quite simply requires public officers and employees to declare their assets, real and personal, the latter to include cash and bank deposits, bonds, etc. It does not require the public officer or employee to indicate whether or not he or she has foreign currency notes or deposits. Neither does it require details such as account numbers, account names, bank identity nor any branch address. All that it requires is a declaration of the total amount of the funds deposited in any bank account or accounts maintained by the public official or employee concerned. Surely, the Chief Justice knows the equivalent value in local currency of his foreign currency deposits to be able to declare the same as part of his assets, especially since the aggregate amount of these foreign currency deposits, by his own account, amounts to US$2.4 Million. The non-disclosure of these deposits, in both local and foreign currency, would naturally result in a corresponding distortion of the Chief Justice’s real net worth. Consistent with the position taken by this Court in the case filed by the Philippine Savings Bank before the Supreme Court last February, pursuant to which the Supreme Court issued a Temporary Restraining Order, I maintain that the Constitutional principle of public accountability overrides the absolute confidentiality of foreign currency deposits. The provisions of R.A. 6426 cannot be interpreted as an exception to the unequivocal command and tenor of Article XI, Sec. 17, of the 1987 Constitution, and I regret that the Highest Magistrate of the land, no less, would think otherwise. The so-called conflict of laws between R.A. Nos. 6713 and 6426 is more illusory than real. Section 8 of R.A. No. 6426 merely prohibits the examination, inquiry or looking into a foreign currency deposit account by an entity or person other than the depositor himself. But there is nothing in R.A. No. 6426 which prohibits the depositor from making a declaration on his own of such foreign currency funds, especially in this case where the Constitution mandates the depositor who is a public officer to declare all assets under oath. Some have raised the question: Why should the Chief Justice be held accountable for an offense which many, if not most others in Government are guilty of, perhaps even more than he is? They say that hardly anyone declares his true net worth anyway. Here lies what many have posited as a moral dilemma. I believe it is our duty to resolve this “dilemma” in favor of upholding the law and sound public policy. If we were to agree with the Respondent that he was correct in not disclosing the value of his foreign currency deposits because they are absolutely confidential, can we ever expect any SALN to be filed by public officials from hereon to be more accurate and true than they are today? I am not oblivious to the possible political repercussions of the final verdict we are called upon to render today. I am deeply concerned that the people may just so easily ignore, forget, if not completely miss out, the hard lessons we all must learn from this episode, instead of grow and mature as citizens of a democratic nation. Those whose intentions and motivations may be farthest from the lofty ideals of truth and justice are wont to feast upon this man’s downfall should this Court render a guilty verdict. I am equally aware of the tremendous pressure weighing heavily upon all the members of this Court as we had to come to a decision on this case, one way or the other. But to render a just verdict according to my best lights and my own conscience is a sacred duty that I have sworn to perform. As one who has been through many personal upheavals through all of my 88 years, I, too, have been judged, often unfairly and harshly. But I have constantly held that those who face the judgment of imperfect and fallible mortals like us have recourse to the judgment of history, and, ultimately, of God. And so, with full trust that the Almighty will see us through the aftermath of this chapter in our nation’s history, I vote to hold the Chief Justice, Renato C. Corona, GUILTY as charged under Article II, Par. 2.3, and that his deliberate act of excluding substantial assets from his sworn Statement of Assets, Liabilities and Net Worth constitutes a culpable violation of the Constitution. Next Article The conviction of Chief Justice Renato Corona paves the way for WHAT exactly? well-written speech but a political decision, nonetheless.. .
JPE admitted that the impeachment charges were being built only after the charges were filed, meaning there was no evidence from the very beginning. why then did they not dismiss the complaint which the defense has been asking since day one? is he trying to be a Pontius Pilate? too much hypocrisy here. 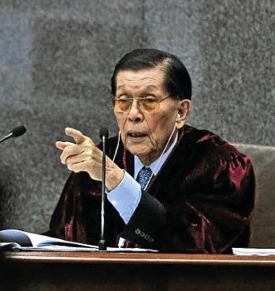 the prosecution presented charges, although JPE admitted as the “loose and hasty crafting and preparation that characterized the presentation of the charges contained in the Articles of Impeachment”, it was the duty of the court to investigate on this nonetheless, otherwise they would not have any basis for their verdict. pontius pilate? why? was he trying to please the people? or is it because he is trying to be a champion of the public, to uphold the ideals and laws that the nation agreed to be under? this is public service, its not as simple as black and white. open your mind, check again before you judge the person of the senator and his work. you might want to check again his very words,” it seemed that the case was being built up only after the charges were filed”. i would not venture any other interpretation than that there was no evidence from the very beginning and as the head of the court tasked to hear the case, the normal thing to do is to find out of those charges will stand scrutiny once the trial begins. To quote further: the repeated recourse to this Court’s compulsory processes to obtain evidence . . .”. Clearly, the complaint charge was not supported with evidence to begin with prompting the defense to file a motion to dismiss that was completely ignored. Now you called that public service? What I can’t understand is why the legislators are the ones interpreting the laws when it comes to judging the guilt of CJ Corona. Their job is to craft laws and not to interpret them. Interpretation of the laws of the land falls on the SC. If the legislators think that the laws have been misused or misapplied by CJ, their best recourse is to amend the law and acquit CJ. Even if they stand as judges in this impeachment case, they are way in over their heads when it comes to interpreting the letter of the law. Half of the members of the Senate are not even lawyers to begin with. What happened was clearly a political decision. CJ was convicted because he refused to play the game of the administration. This impeachment verdict will become a turning point in the presidency of the PNoy. dapat nga akaupo ay abugabo kasi alam nila kung paano tratratuhin ang batas na walag naagrayado. Paano mo babaguhin ang isang bagay kung wala kang alam tungkol sa bahay na yon? Hindi porke mabuti ang batas sa iba ay mabuti na yon sa lahat. kung lahat tayo me interpretasyon, sino ang tama at sino ag mali? Puede kang maksakit kung mali ang interpretasyon mo. After thinking about this for a while, I’ve realized what a disaster this is for the country (not to mention being somewhat personally disappointed, just because my own predictions very rarely fall so far off the mark). But one of the perhaps dubiously positive outcomes is JPE reminding everyone that he is indeed still the same guy he’s always been, and not the statesman many people were being snookered into believing he was. once a trapo always a trapo! Proofed: and corrected by Andy Blunden, February 2005. The proletariat is that class in society which lives entirely from the sale of its labor and does not draw profit from any kind of capital; whose weal and woe, whose life and death, whose sole existence depends on the demand for labor â€“ hence, on the changing state of business, on the vagaries of unbridled competition. The proletariat, or the class of proletarians, is, in a word, the working class of the 19th century. The Honorable Juan Ponce Enrile’s decision was very thorough, truthful, realistic, admirable and expressed the genuine interpretation of the universal laws of man. Good work.